These high power fans are necessary to ensure cooling requirements of modern RF amplifiers. 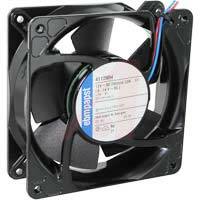 They provide sufficient airflow and reliability/long life. You may have noticed that a decent fan is not so easy to find in shops. Since these are suitable for more specialized applications many regular shops don't stock them. Fortunately for you, we are now offering the fans we use in our transmitters. I hope they serve you well.